Southeast Asia is a very good tourist destination all year round because of the beautiful islands located here. They also offer relaxing rain forests and breathtaking caves that can wow tourists from different countries. Of course if we are going to talk about beaches, Maldives will somehow be one of our dream destinations. But you don’t need to spend a lot of money to experience the beauty of Maldives. In Malaysia, a hidden island called Mataking is best known as ‘The Little Maldives’ of Malaysia. It can be found off the coast of Sabah in East Malaysia, near the Philippine border. Mataking island consists of two islands, Mataking Besar (Big Mataking) and Mataking Kecil (Small Mataking). During low tide, you can actually cross from Mataking Besar to Mataking Kecil while crystal blue bodies of water surround you. 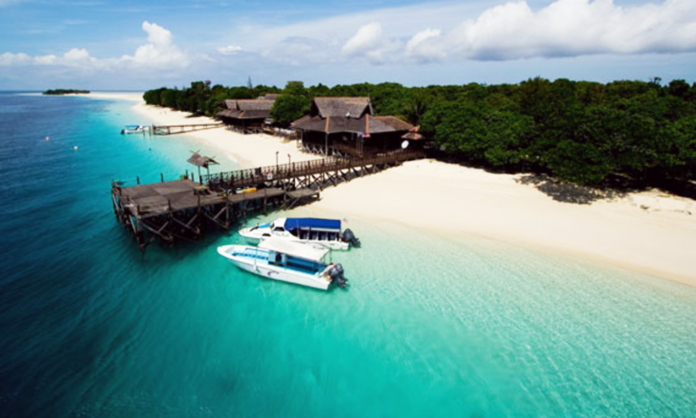 There is only one resort on Mataking Island which is the ‘Reef Dive Resort’. It is a luxurious and classy establishment which also has Nipa Huts floating on water that will make you really feel that you are in Maldives which are all first class. It has various facilities such as bars, restaurants, BBQ facilities, spas, an outdoor jacuzzi and other recreational facilities. Mataking Island is perfect for honeymooning couples as it offers optimal privacy because the resort has a maximum of 40 units only and it serves pristine experience on the island. You can have the complete Maldives experience for only USD$170-250 depending on the suite that you will choose. While the place is vividly patterned after Maldives, the island exudes a local character that is embraced by every tourist. The aisle of huts basking in the glory of nature’s beauty has hauled in countless of tourists throughout the past years.